Stephen W. Terrell's (MUSIC) Web Log: WACKY WEDNESDAY: Let There Be BBQ! There was so much rain in Santa Fe last weekend, I hate to think how many would-be BBQers were discouraged. So I'm going to try to work a little magic here and try to appease the rain gods with some great songs about barbecue. The art of barbecue has been linked to American music since the early part of the last century. In 1927 Louis Armstrong & The Hot Five recorded a tune called "Struttin' with some BBQ." But as the Onion A/V Club pointed out a couple of years ago, Satch's song probably wasn't about pork ribs. Cab Calloway's Jive Dictionary defines "barbecue" as "the girl friend, a beauty." 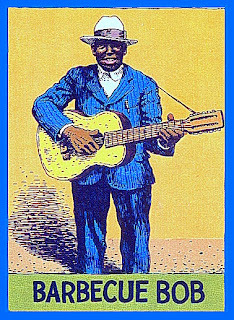 Also in 1927, one of the first musicians to sing about smoked meat was an Atlanta bluesman named Robert Lincoln, a chef in a high-class BBQ joint who recorded under the name Barbecue Bob. His very first record, recorded in 1927 was called "Barbecue Blues." Jas Obrecht, editor for Guitar Player magazine for 20 years and the founding editor of Pure Guitar magazine, writes that the song "began with a spoken dialog about Bob’s job as a barbecue chef; this was pure minstrel shuck-and-jive. This was also the first record to feature Charley’s signature laughter. It was an old shtick dating back at least to George W. Johnson’s 'Laughing Song' cylinders of the 1890s, but it was a good way to get Charlie’s name out there. Near the end of the song, the brothers sang a verse in unison." And thus, barbecue forever became intertwined with the blues, with the smoke blowing over into the fields of jazz, country, rockabilly and rock 'n' roll. So here's a Spotify playlist of BBQ songs, beginning and ending with Barbecue Bob -- and a lot in between: Satch, ZZ Top, Mojo Nixon, Lucille Bogan, Pere Ubu and more. So hear these songs, gods of rain, and let there be some sunshine, at least for the coming weekend. And to you, the reader: If you get the chance to grill outside Saturday or Sunday, be sure to play this then.